East Dallas receives a significant amount of rainfall per year, even more so than the national average, putting homes and businesses at risk of experiencing leak and flood damage issues. To best serve the community, the technicians at 911 Restoration of East Dallas stay available 24/7/365 to provide emergency storm repairs to property owners in Mesquite, Garland, Allen, and the surrounding cities. Implementing speedy water damage repair is a priority to this water mitigation company because we know that quickly extracting water is the best way to prevent severe flood damage and structural issues. To accommodate customers with immediate water damage restoration, technicians guarantee to arrive at the job site within 45 minutes of receiving a call for emergency water extraction services. We are dedicated to providing you with same-day services for all types of water damage issues, including burst pipe emergencies, water leak wall bubbles, and sewage cleanup. Call 911 Restoration of East Dallas immediately after you discover invasive water in your residential or commercial property and we will provide property owners with a free home inspection right away. With all of the rainfall in the East Dallas area, property owners need to be prepared for the impact that the weather can have on their homes or businesses. Having a water damage restoration company on your side that can implement leak detection and repairs on a moment’s notice is crucial to limiting structural damages and property loss. Being a complete home restoration company is what makes 911 Restoration of East Dallas so unique. 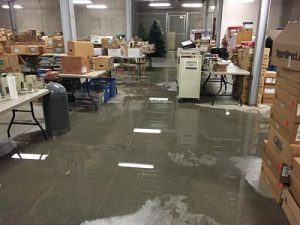 We are equipped to administer emergency pack-out and storage services, repair flood damages, and implement thorough drying services. The repair techs will also test and evaluate any structural damages that may have occurred to your property due to a storm, pipe burst, or other water disasters. Customers can count on us to handle every aspect of a water damage restoration job. So, call on the highly trained technicians in East Dallas when you need top-of-the-line, water cleanup services, and we will give you the peace of mind you deserve. Once the flood repair team has determined the type of water damage restoration work that needs to be conducted in your property, you can focus on the financial side of the process. 911 Restoration of East Dallas works with all types of insurance companies and keeps its prices competitive because we want to make it easy for customers to receive our services. If you have never had to file an insurance claim before then it may be difficult to understand what coverages you are entitled to receive. To help you through this process we provide free insurance consultations to all of our customers. It is essential to submit your claim as soon as possible after a water emergency has occurred to ensure you get complete and quick compensation. Call 911 Restoration of East Dallas today, and we will not only provide you with affordable prices but with a Fresh Start as well.